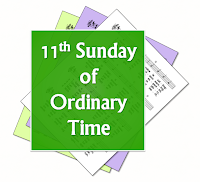 A selection of hymns and songs, based on themes from the Roman Catholic lectionary for the 11th Sunday in Ordinary Time in Year C.
A small selection of hymns which are still copyright may also be included, if they are a particularly good fit. First: II Samuel - Nathan delivers God's rebukes to David. David repents, and the Lord forgives him. Psalm: 31 - Forgive me Lord the guilt of my sin / Happy the man whose offense is forgiven / But now I have acknowledged my sins / You are my hiding place. Second: Galatians - Faith in Christ, rather than fidelity to the Law is what justified us ... now I live the life of Christ, who lives in me.. Gospel: Luke - Jesus eats at the Pharisee's house, and a woman anoints his feet with ointment. The one who has sinned more greatly is more greatly forgiven. Your faith has saved you. Forgiveness. Faith in Christ who forgives. New life in Christ.